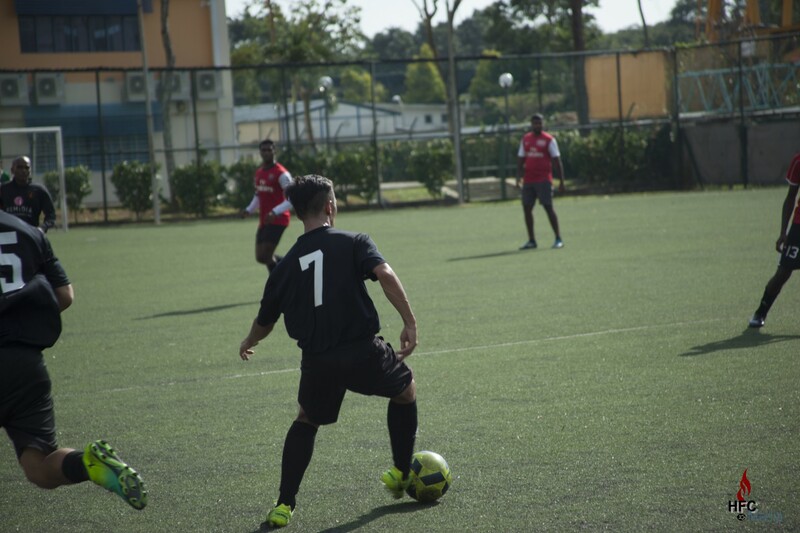 Returning Yio Chu Kang Secondary School and against FC Hospitality for the second week running, Hilderinc FC produced a fine display in their second of three friendly games before their resumption of league duties in the ESPZEN Saturday League Division 3. After last week’s bruising encounter, it was a prefect practice for the Blacks against a side which could very well form a rivalry in the same grouping next season should their respective campaigns pan out according to well-intended plans. The Hilderincs, welcoming Mike De Bear, Denis Lobov, Glenn Sandhu and Sunny Tharidu from their respectively breaks, kept to a similar starting lineup to last week, apart from the involvement of the latter two and Clement Ong, who slotted into to a highly strategic system. As intended, the Blacks were in full form as they worked the ball with ease and flair, leaving the opponents uncomfortable with each move. And their aptitude was evident when they took the lead with a sweeping play involving Adib Alias, Xerxes Lee and Glenn Sandhu, with the latter in full flight before cutting a delightful ball across the face of the goal for Travis Fujji to open his account for the Blacks inside 11 minutes. Even before the exuberance was settled in the young forward’s face, he turned provider, laying off another Adib Alias’ pass into the path of Ian Morris, who made no mistakes with finish. Interesting, the Hilderincs took a mere 22 seconds from the FCH restart after the first goal to score their second. Buoyant by the start, the Blacks pressed hard to remove the opponents from the equation with their famed pass and move football, which was a delight to behold at times. However, in keeping with the objective of experimenting, the Hilderincs refreshed the lineup midway through, and though there was a little getting used to things, by and large, there was little to suggest that the proceedings would be anything but routine. Just as the Blacks were formulating their dominance, FC Hospitality were handed a lifeline by the referee who bought the attempts by the FCH player in selling him a penalty. And though Sunny Tharidu was spot-on in reading the kick, the power behind the shot reduced the Hilderincs lead to half. With confidence rising from the goal, FC Hospitality increased their intensity, and as with the first game last week, over the top at times, leaving the Blacks feeling aggrieved by the referee’s lenient stance to FCH’s approach. There was, however, no grounds for finger pointing from the Hilderincs, whose rare moment of lapse allowed the opponents to equalise close to the break, and while it was not reflective of the overall happenings, it was somewhat irksome nonetheless to have an unproductive side draw parity against the run of play. Despite that, the objectives were not lost, and the Hilderincs continued with their aims, giving a full ranging of options a try in the second half. As it was in the opening period, the Hilderincs were in wonderful form with their expansive football, passing and moving with fluid movement, and were unfortunate not to take the lead through Travis Fujji, who was denied by the FCH goalkeeper. But, adding to another point for scrutiny and improvement, another lapse in attention handed FC Hospitality the lead from an innocuous cornerkick. While the Hilderincs responded positively, the game descended into a contest of two contrasting tactics with the Blacks seeking to play with the ball, where else, the opponents punting it up the pitch to see what may come out of it, though they did hit the cross bar with a fortuitous attempt. Pressing hard, the Hilderincs thought they had levelled the game late on through Ian Morris, but to the Blacks’ aghast, the forward was denied his brace and equaliser, after the referee, who, on more than one occasion in the first half had had questionable offside rulings, chalked off what was a genuine finish, but if by any chance it was a correct decision, he was certainly culpable of not awarding the Hilderincs a penalty for a stonewall foul on Erdogan Albay in the lead up to that. 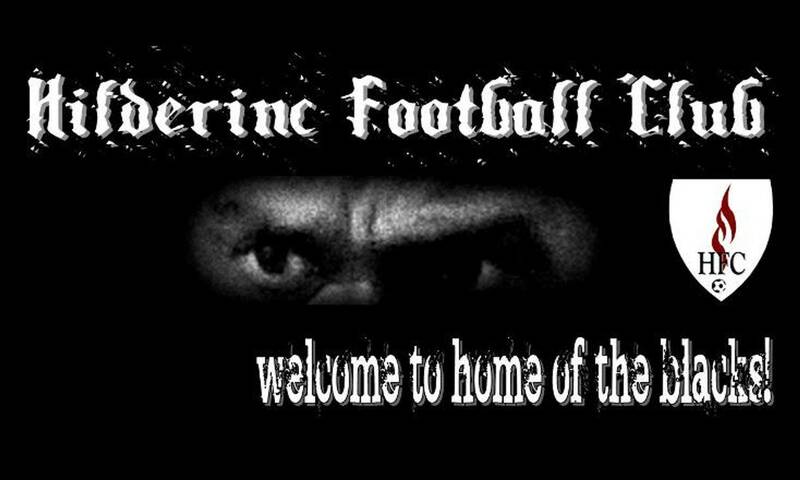 In spite of the scoreline, the Hilderincs were well pleased with their display and can take heart that with the team settling well with a wonderful mix of players, both short and long term prospects looks rewarding.